The idea for Bonafide Comics originally began in the early 90s. 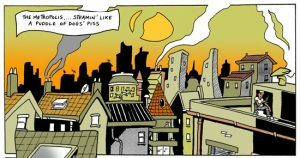 I came back from a backpacking trip in Southeast Asia full of ideas and determined to publish comics. 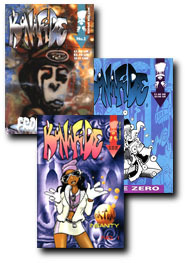 I had been creating dummy issues of Doxi the Dog to try and sell the concept to publishers and this eventually morphed into Bonafide Comics, inspired by street art, the hip-hop music scene and especially magazines like Deadline (Home to Jamie Hewlett’s Tank Girl). Back in Bristol, I teamed up with Luke Fay and we co-created stories like Breakdown (An apocalyptic tale following three female protagonists), Ed n Ed, a self-styled anarchic pastiche based on myself and Luke. Then, there was Dooley Dooce – the less said the better. We also, over proceeding issues had artists such as James Fox, Mark Swan, Nick Walker and many others. In 1994 Issue Zero sprang onto the streets. We got spots on TV, radio and were featured in ID magazine, HipHop mag and others. It was a promising time and by issue 2 it felt like something great was starting to happen. Unfortunately, a series of incidents rolled out as we were putting together issue #3. The mac with the cover artwork got stolen (no back up) and mixed with fatigue, a lack of finances it felt, despite the positive noise surrounding the title Bonafide comics was no longer a variable concern. Alas, issue #2 (the third issue) was to be the last, I am looking into making the material available again in some form, stay tuned. 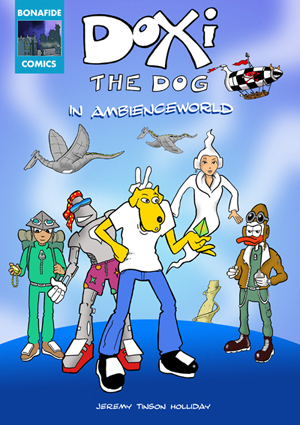 In coming back to publishing around 2011, I finally finished off a ‘Doxi the Dog’ tale that had originally appeared in Bonafide Comics) albeit a more adult version back then and released the full-colour graphic novel under the Bonafide imprint. Since then, we’ve added a few more children’s books.